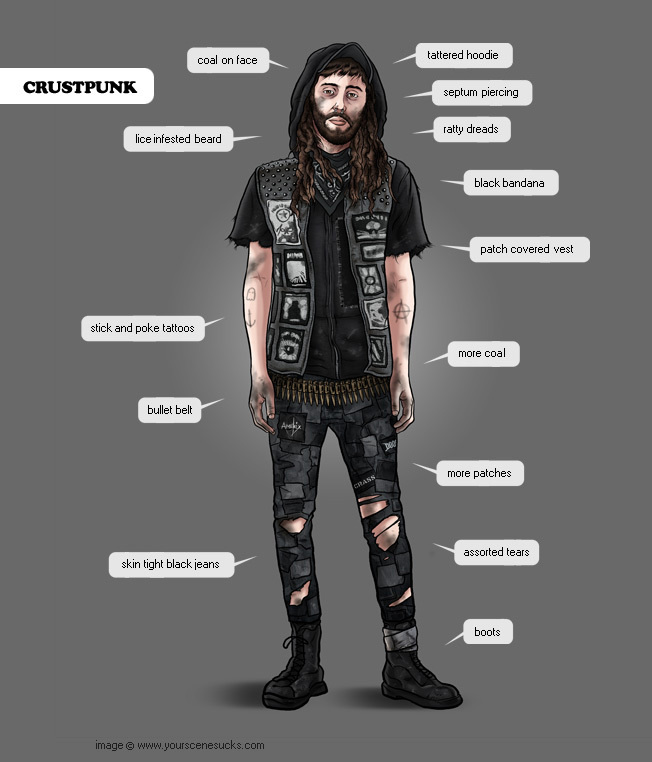 By far the smelliest of all the scenesters, the Crustpunk embodies the D.I.Y. punk ethos with his nihilistic attitude and “freegan” diet. Typically an extremely unkempt individual with patches and pins barely holding together his soiled wardrobe, the Crustie goes months on end without bathing, ensuring his unemployment. When not attending politically radical protests and Food Not Bombs events, the Crustie can be found panhandling on city streets with his banjo and emaciated dog at his side. Despite being anti-corporation, the majority of his earnings goes towards beer. The Crustpunks are also anti-authority, anti-work, anti-government, anti-religion, anti-showers, but are somehow not anti-five-day-old-burrito in the Trader Joe's dumpster. Even though he lives a nomadic lifestyle squatting in abandoned buildings and train-hopping, the Crustie never strays too far from home. Eventually he'll need to hit up mom and dad in the suburbs for more cash, so he can stay poor. no wifi on freight trains or inside dumpsters.